Upside has created a new interactive data map to make finding the best places to invest in Australia an absolute breeze! From affluent suburbs to million dollar properties, this user-friendly map identifies the areas across Australia with the highest housing prices. 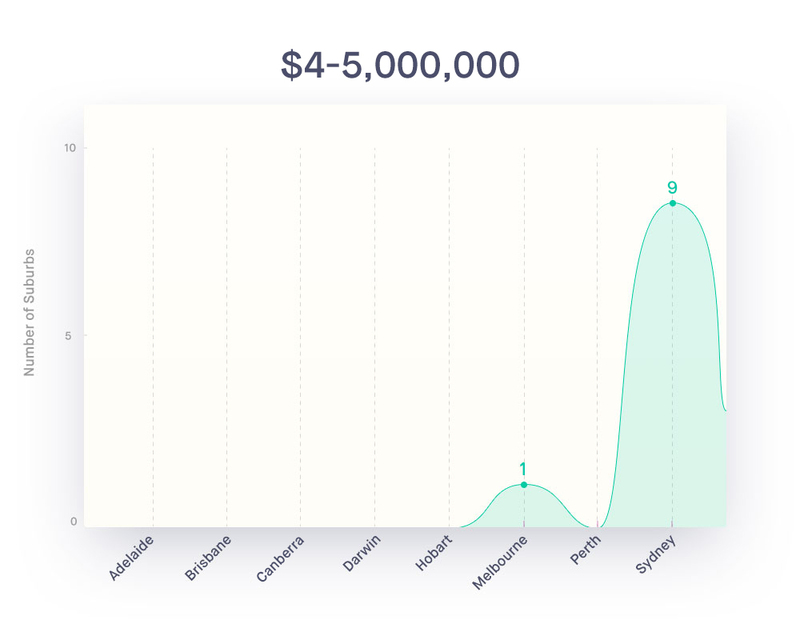 By revealing the wealthy towns and suburbs with a median property value of one million dollars or more, this tool can help you figure out how much homes in your suburb are worth. 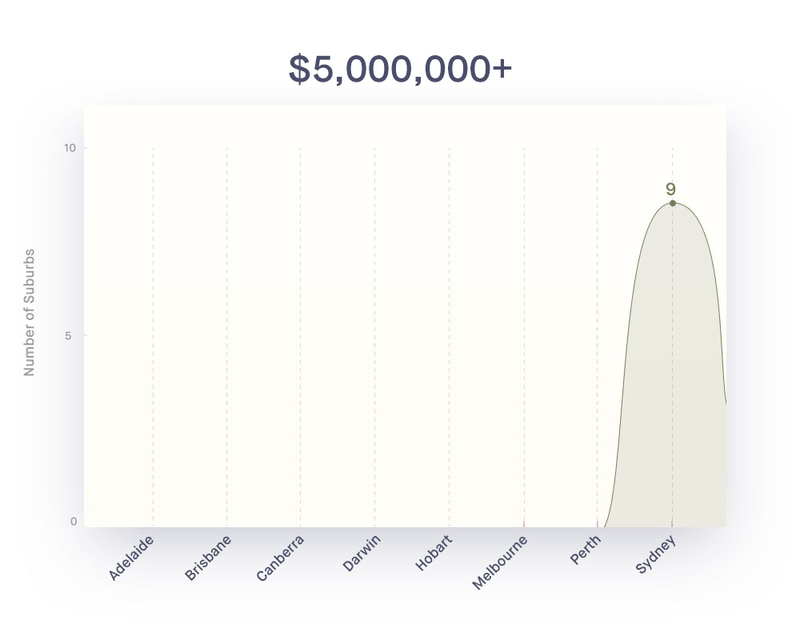 Total number of suburbs in Australia with a median property value of one million dollars or more. Whether you’re planning on selling your house or just curious about Australia’s most expensive towns and affluent cities, this unique and interactive service from Upside can give you all the information you need. It’s also the perfect tool to help you find the best areas to expand your property portfolio or purchase your next family home. 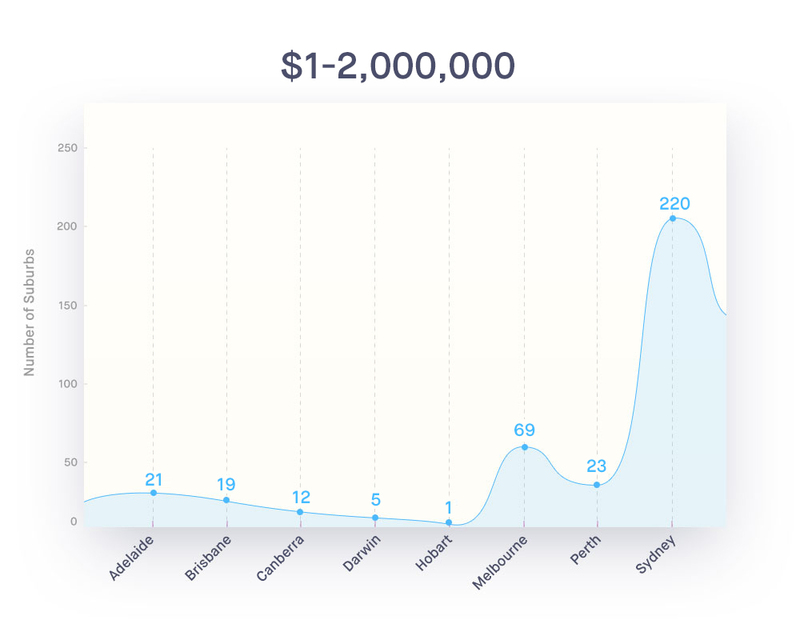 As you can see from the graphs below, 519 suburbs across Australia exceed the median value of one million dollars with the majority located in Melbourne and Sydney. Number of suburbs in Australia where the median property value is $1-2,000,000. Number of suburbs in Australia where the median property value is $2-3,000,000. Number of suburbs in Australia where the median property value is $3-4,000,000. Number of suburbs in Australia where the median property value is $4-5,000,000. Number of suburbs in Australia where the median property value exceeds $5,000,000. Total number of suburbs in Australia where the median property value exceeds one million dollars. 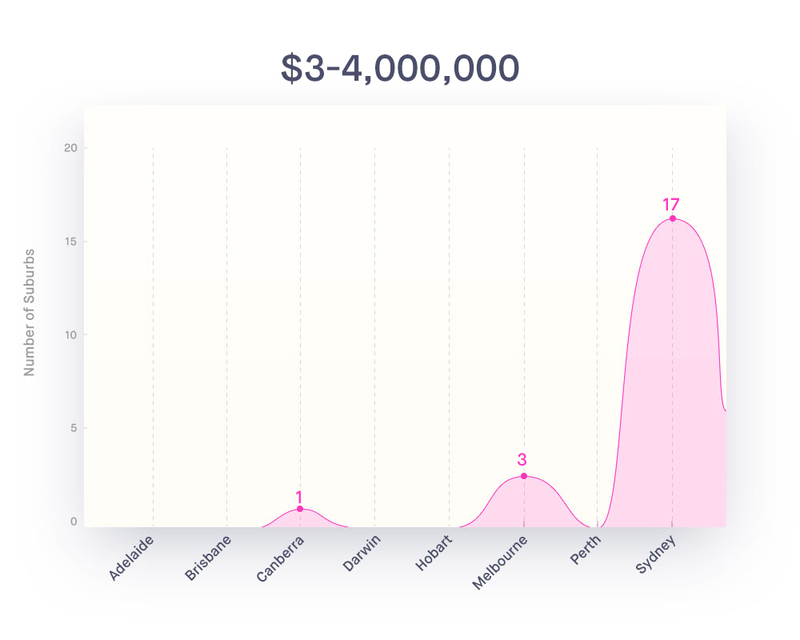 Of all the capital cities, Sydney has the highest number of areas with a median property value of one million dollars or more. 343 of Sydney’s suburbs exceed the one million mark. It also breaks the mould as the only region in Australia with a median suburb property value of five million or more. 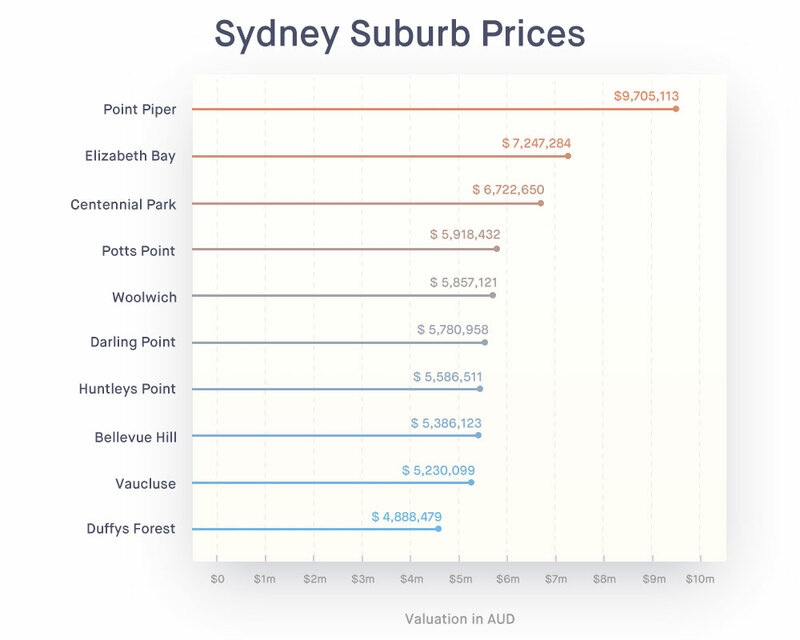 There are nine Sydney suburbs that exceed the five million mark: Point Piper, Elizabeth Bay, Centennial Park, Potts Point, Woolwich, Darling Point, Huntleys Point, Bellevue Hill and Vaucluse. Sydney also has ten times the amount of million dollar suburbs than Adelaide and Brisbane and over three times as many as Melbourne. Top 10 Sydney suburbs where the median house price is over $1,000,000. 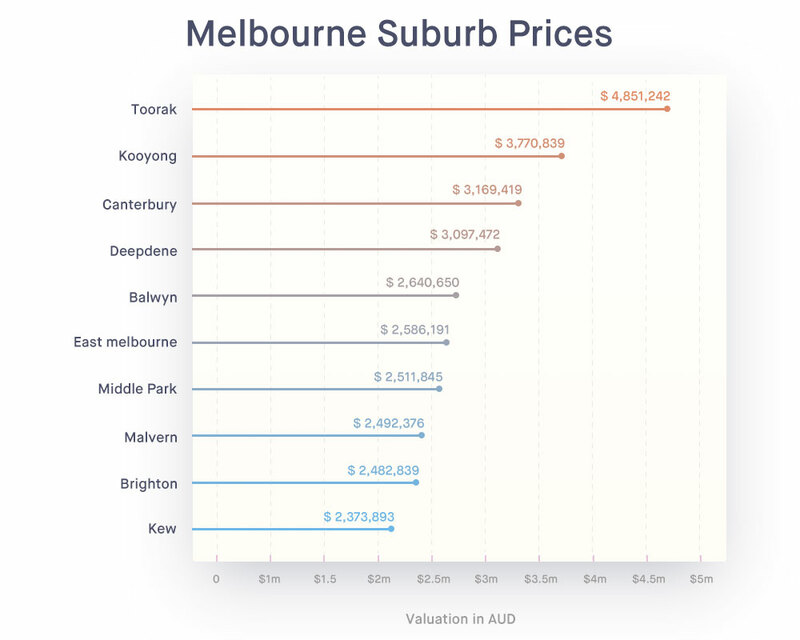 The highest median price in Melbourne is $4,851,242 and is located in Toorak. 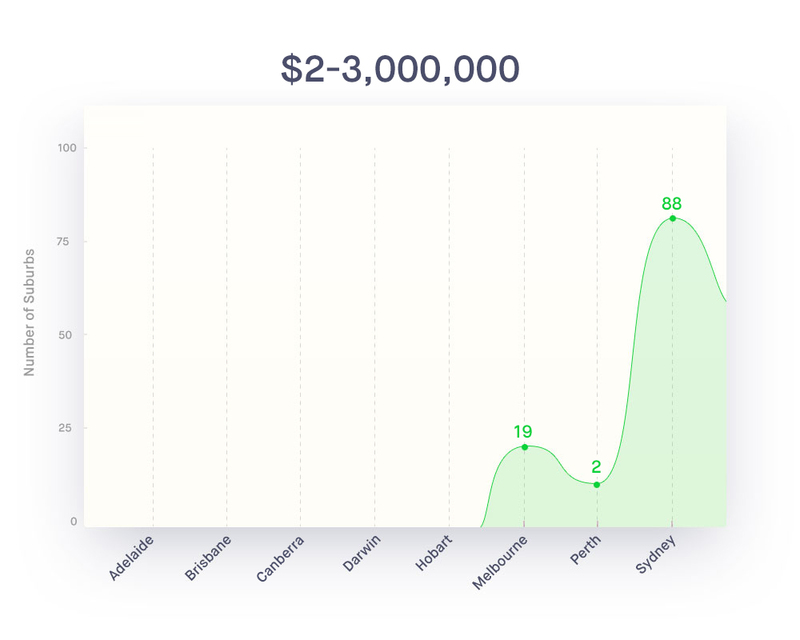 Aside from Sydney, Melbourne is the only Australian city with a suburb median value over three million dollars. 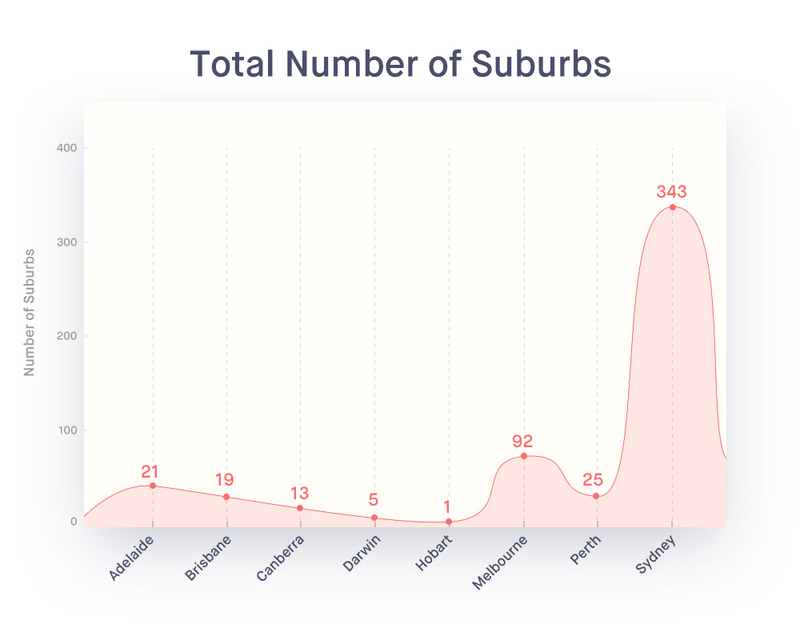 Only four suburbs in Melbourne exceed this mark, however, and these are Toorak, Deepdene, Canterbury, and Kooyong. Top 10 Melbourne suburbs where the median house price is over $1,000,000. 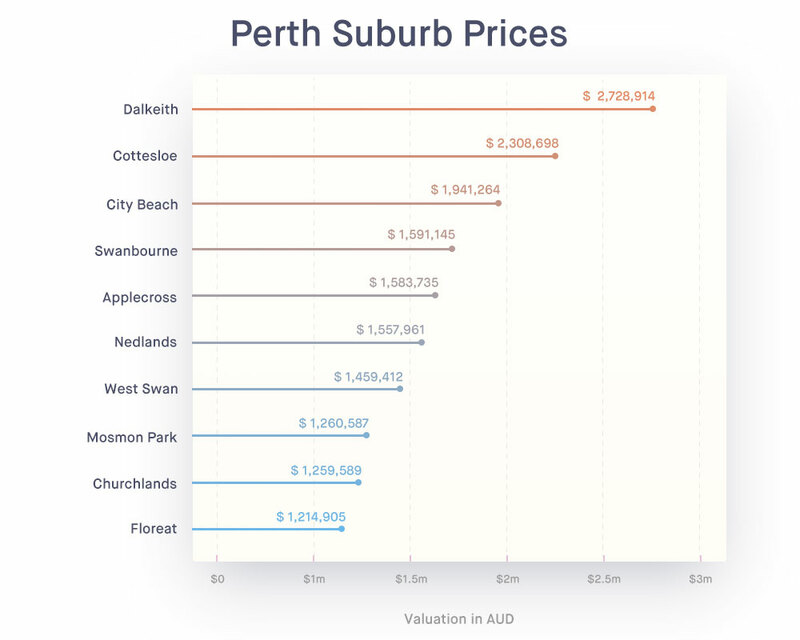 Unsurprisingly, Perth comes in third on the list of highest number of suburbs exceeding the one million dollar median value mark. The most affluent towns in this area are Cottesloe and Dalkeith, which are both within the two to three million dollar bracket. Top 10 Perth suburbs where the median house price is over $1,000,000. What is the stauts of the Australian property market? Want to find out the value of your property in just 30 seconds? Get a free online property report from Upside.